With a renewed hope and the help of the Knave, Alice searched for her lost love and went to a place where she knew the only place she knows he’ll be safe. But with both Jafar and the Red Queen on to the genie as well, who will get there first? Will Alice find Cyrus? Will Jafar succeed and be able to change the laws of magic? Where does the Red Queen’s allegiance lie? What an awesome winter finale! Mark Isham’s soundtrack really made it, too, blending it well with the story. 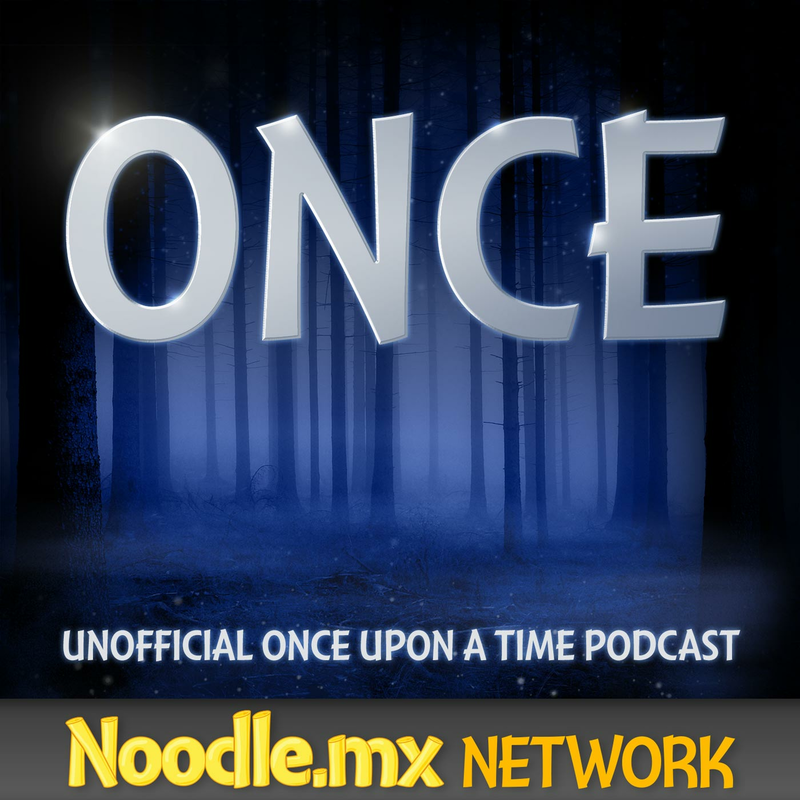 The writers, Edward Kitsis, Adam Horowitz and Zack Estrin also wrote a great eighth episode. So Cyrus wasn’t always a genie. He was, in fact, once a human. The question is though, how did he become a genie? Is it something that we are about to see in the upcoming episode? Did Cyrus became a genie when he tried to free another genie? Cyrus was born a long time ago in Agrabah to Aladdin and Jasmine, who were the Sultan and Sultana, thus making Cyrus Jafar’s distant ancestor. Aladdin still has the bottle containing a genie from his time as a “street rat” that he got from the cave of wonders. He has one wish left. Somehow Sultana Jasmine falls ill and there is no way to save her except to use the third and final wish. Aladdin uses the wish on Jasmine but the price of the wish is that his son Cyrus now becomes the new genie of the bottle and is cast out of Agrabah to find a new master. It’s a really great parallel to what we saw in 108 “Home” with Will and Cyrus (this is ONCE. They love their parallels). Also, Cyrus was very attached to his mother’s compass. If her life was saved but his freedom forfeited, I imagine he’d be rather attached to something that belonged to her. Does Aladdin and Princess Jasmine have anything to do with Cyrus becoming the genie? Wouldn’t it be cool to see not only the two of them, but Abu as well? On the other hand, Jafar already had the oil lamp, which looked a lot like the ones in Aladdin’s tale so it looks like the show could go even without introducing Aladdin and Jasmine. Furthermore, is Cyrus’s mother still alive? Is she in a different realm, that’s why the compass doesn’t stop pointing? Alice and Cyrus’s fighting scenes with the men that ambushed them was awesome. Alice really can fight! Some of the subtle hints showing Alice and Cyrus felt a bit more sexual, taking a bit away of the purity and innocence of their relationship. 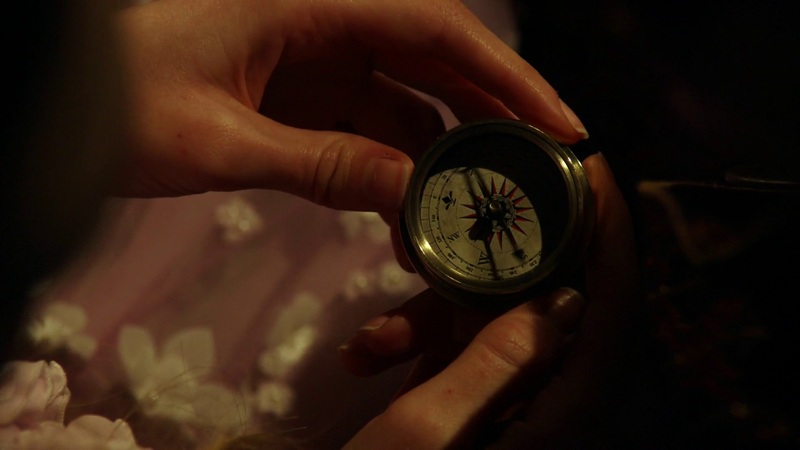 Perhaps they would have shown Alice finding out about the compass in another way. After all, they aren’t married yet. Cyrus’s Lost and Found compass reminded us the very compass that Emma and Hook searched for in Once Upon a Time in the episode Tallahassee, as well as Hansel and Gretel’s tale in the episode True North. It also reminded of Pirates of the Caribbean, where the compass points you to your true love. Cyrus told Alice that “Sacrifice is the measure of true love,” making him want to sacrifice everything to keep Alice alive. However, Alice seemed to be willing to do the same. Whoopi Goldberg, by the way, did an awesome job as Mrs. White Rabbit! It sure was fun to hear her voice in Once Upon a Time in Wonderland. This episode showed us a lot of Anastasia and Will’s old wagon, which was actually their old place before Anastasia come to power as the Red Queen. The Red Queen also looked and sounded more like Anastasia in this episode, even taking her crown off and letting her hair down like the old Anastasia. The Red Queen would have realized what she was losing ever since Jafar playing against the rules, making her change allegiance and go by her instincts. 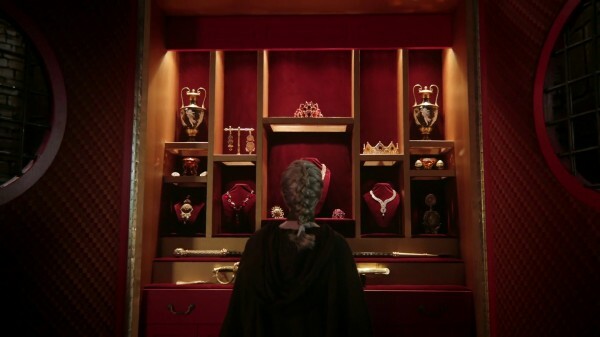 By the way, the Red Queen’s chest looked the same place where she stole the crown before marrying the King. The chest is even arranged in the same in the same way. Which of the Tweedles betrayed the Queen? Is it Dee or Dum? They weren’t named in the episode, after all, just Tweedle 1 and 2. It seemed that Jafar could feel that the bottle wasn’t the right one by its weight compared to the others. Does the bottle’s weight changed when the genie isn’t inside the bottle? How did he figured out that it was fake? 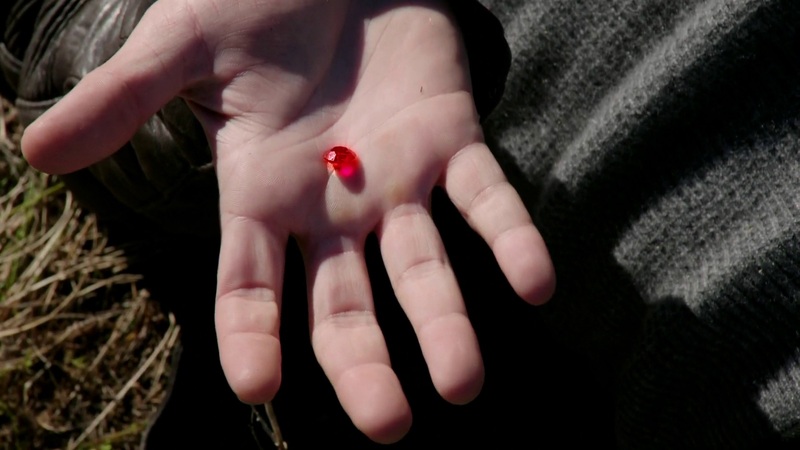 It was nice to see the White Rabbit confessed and repented; he did it only because the Red Queen is holding his family hostage, and that he just did everything he did to keep them alive. He also said that “When someone you love is in danger, you’ll do anything to save them,” it may have cost him to betray his friends along the way, but his reasons were somehow justified. In addition, it was great that Alice gave the White Rabbit the benefit of the doubt. The White Rabbit has a name — Percy, meaning to penetrate the hedge. When Jafar made the storm, we initially thought he was making his own curse. He must be really wagering with revenge and intelligence when he sent that cloud after the queen. 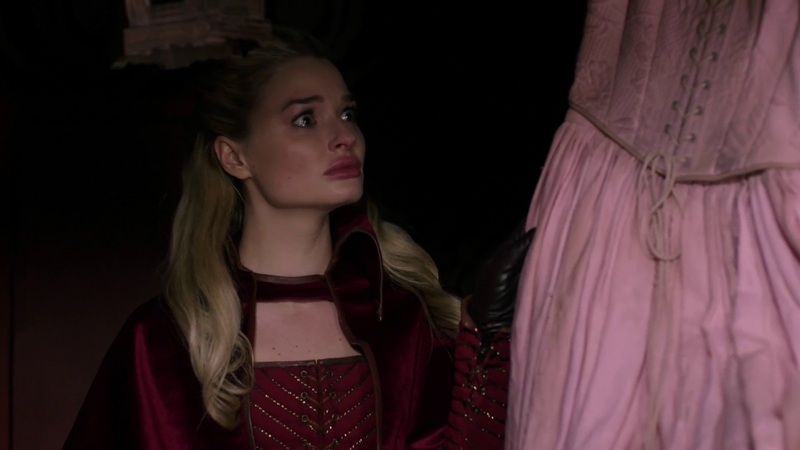 The Red Queen came a little unhinged in this episode, looking a bit desperate for Alice, Will and Cyrus to believe her. Is she just keeping the mean Red Queen facade to be able to get what she wants and change the past? It was also awesome to see her wanting to sacrifice for love; sacrifice everything just to get Will’s love back again. However, with Will’s heart not inside him, it seemed that Alice may be able to help her bring her own love back. Is the Red Queen going to go back to being Anastasia? When the Red Queen used the bottle to deflect the lightening, it bounced off and hit Will, thus hurting him and Alice. When Will wished to end Alice’s suffering, Will accidentally released Cyrus, making himself the genie. Another Lost reference in this episode — a shot in the scene with Will’s eye opening when he woke up inside the bottle as the new genie. Does the water flowing through the “out” lands lead OUT of Wonderland? Now that Will is the genie, it seems like everyone is on a race to find the bottle. Who will find it first? Now that the genie has changed, does it matter who the genie is? Or does it really not matter whether who the genie is as long as Jafar can get his hand on the bottle? If there are other genie’s that exist, why go that far on getting it? I’d just like to say that I really like the idea of Will (The Knave) being the Genie now, because if you think about it Will is more like the Genie from the original animated Aladdin then Cyrus was because Will is both the comic relief and knows all the modern day pop culture of our world (Land Without Magic) just like the Genie in Aladdin did. Just something I thought I point out Thanks Once Podcast. If they got Robin Williams to voice the genie just like what they did with Whoopi Goldberg as Mrs. White Rabbit, wouldn’t it be cool since he voiced the genie in Aladdin? There are still five more episodes to go of the 13 episodes the show is slated to do when the show comes back next year after the long hiatus and a lot more stories can be told within those five episodes. What else is in store for Alice and Cyrus? How would the season will end? What if Jafar became a genie? The Red Queen seemed to be a lot smarter than everyone thinks of her. Despite Will and the other people (ie; Alice) are still having second thoughts about her sincerity, it looks like the Red Queen tried to make everyone prove otherwise. But will Anastasia win back Will’s love? If Jafar finds Will first, can Jafar even use him because Will doesn’t have his heart? Will the Red Queen be willing to work with Alice and Cyrus to find Will and get his heart back? Is the Lost and Found compass come back into play to help them find Will? Let us know what you think about “Home” by sharing your thoughts below on the comment section or sending us an email.